Saturday, July 15th will be full of fun, family activities for the community and for all those who love Palenville. Come celebrate 200 years of life at the base of Kaaterskill Clove. Ragamuffins in July Parade - Palenville honors its longtime Halloween tradition by repeating this popular parade in July. Adults can join in, too, with costumes celebrating Palenville's history as a tannery town, artist colony, resort destination and most beautiful spot to live. Rumor has it that Rip Van Winkle himself will wake up to attend and maybe bring all his friends. Historic Palenville Tour - 11:30 am to 5 pm - Visitors can ride a shuttle that circles through the hamlet and learn the story of Palenville, touring the locations of historical significance. Each trip lasts about 20 minutes and departs from the Bicentennial Country Fair. 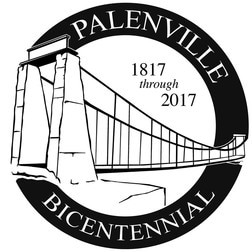 Palenville Bicentennial Concert - Allowing time to eat dinner at our local restaurants, the concert will begin at 6:30pm. A popular band, ThunderRidge, will play outdoors at the Rip Van Winkle Country Club followed by fireworks celebrating Palenville's landmark event.